Oh, I'm such a sucker, but I mean well, I swear. I've spent a very large portion of the last several years constantly searching for allergy friendly foods for my son. It's an expensive past time, one that has found me wasting way too much food over the years, but it's not like I can give up. One of leaves adventures involve Tofutti, the milk free company. First we tried Tofutti Pizza which had so-so results with my son. More recently we tried the Tofutti Cuties ice cream sandwiches and while my son wasn't a fan, I thought they weren't that bad, or to put it another way, they were decent enough to encourage me to purchase something that I've had my eye on for quite some time. These are Tofutti Hooray Hooray Crispy Crunch Bars. 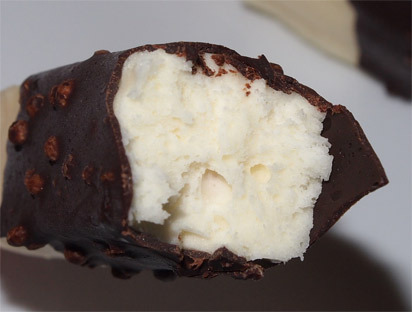 They are Smooth Creamy Vanilla Dipped in rich dark chocolate with crisp rice crunches. 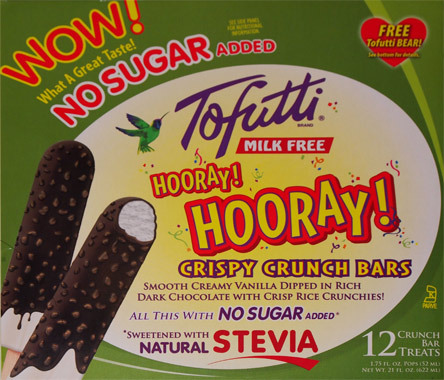 Notice there is nothing between the words vanilla and dipped because these treats are milk free... in fact, they are sugar free too because they use Stevia. They come in pairs, don't know why. Now they look pretty cool and I'm trying to be positive about my cranky nature versus a treat made of soy and tofu..... we started with the shell. It's not bad. It's a real mild taste that my son enjoys for about 3 minutes before giving up. Me? I press on to the horror that is underneath the shell... I'm sorry, I don't mean to knock the treats of people who can't have dairy, but this stuff is just kind of slimy and gross. I just don't get it. Besides the gigantic air bubbles you see above, you would think there might still be hope. I mean, the Cuties weren't slimy like this. They must mess with the texture to make them more popsicle-like maybe? Or maybe it's the quest to use Stevia instead of sugar (side note: why??). What a bummer. Had they used the same stuff that's in the cuties then these may have been decent, but my texture-phobic self really doesn't like the vanilla part at all. It's down right repulsive to me. Sure, I pressed on and finished the treat if only to be a true reviewer (and to set a good example for my son), but I did not enjoy doing so. On Second Scoop: A few days later my son asks if we can have his chocolate pops again. I was a little afraid, but I'll take one more for the team, so stand by : yeah, the shell is acceptable but the insides really drive me nuts. It's just so weird. I really need a little grit in here so that I stop thinking that I'm eating frozen soap. I'm guessing it's the Stevia. I eat the Tofutti Marry Me bars and they are really tasty. Certainly not in the least bit slimy. I second the vote for Marry Me bars!